Craignish Castle is located on the Craignish peninsula in Argyll, western Scotland. 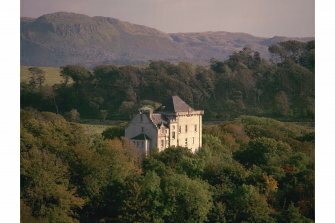 The present castle includes a 16th-century tower, the seat of the Campbell family of Craignish and Jura. In the 19th century it was sold to the Trench-Gascoigne family of Parlington Hall, Yorkshire, who built a large extension to the tower. In the later 20th century the house was restored, and parts of the 19th-century extension were demolished. The Campbells of Craignish claim descent from Dugald Maul Campbell, first Laird of Craignish (1156–1190), who was the second son of Sir Archibald Gillespic Campbell, ancestor of the Dukes of Argyll. The seventh laird left only one daughter, Christine Campbell (b. 1323). Her weakness and imprudence caused the majority of the estate to be resigned to the Knight of Lochow, who took advantage of her. She was left with only a small portion of the upper part of Craignish under his superiority. The nearest male representative - Ronald Campbell - fought hard to win back his heritage, and the then Chief of Clan Campbell was obliged to allow him possession of a considerable portion of the estate, but retaining the superiority, and inserting a condition in the grant that if there was ever no male heir in the direct line the lands were to revert automatically to the Argyll family. The present castle was built in the 16th century as a tower house, and measures 42 by 33 ft. It is said to have withstood a siege of six weeks by Colkitto MacDonald. Ranald MacCallum was made hereditary keeper of Craignish Castle in 1510. In 1544 the direct line ended, and the rightful heir, a collateral relative by the name of Charles Campbell of Corranmore in Craignish had the misfortune to kill Gillies of Glenmore in a brawl. This compelled him to flee to Perthshire where he settled at Lochtayside under the protection of the Breadalbane family. This unfortunate event therefore prevented Charles from claiming the estate, and so it fell into the hands of the Earls (later Dukes) of Argyll. Charles' descendants at Killin, Perthshire were later recognized by the Lord Lyon as Chieftains of the Clan Tearlach branch of Clan Campbell and from them descended the Campbells of Inverneill. A grandson of Duncan Campbell, 8th of Inverneill, in the 1980s owned one of the apartments at Craignish Castle. The title 'Baron of Craignish' was created for Edmund Kempt Campbell by the Duke of Saxe-Coburg-Gotha in 1848, and used by his descendants in Britain, though this was after the sale of Craignish. In the 19th-century Craignish Castle was purchased by Frederick Trench-Gascoigne and his wife Isabella, heiress of the Gascoigne family of Parlington Hall. Trench-Gascoigne owned 5,591 acres (2,263 ha) in Argyll in the 1880s. In 1837 the tower house was extended by the architect David Bryce, working to designs by William Burn. In 1941 the house was requisitioned for use as a home for children evacuated from Glasgow. In the later 20th century it was restored and divided into privately-owned apartments.